As some readers already know, in addition to providing direct drive, reduction and/or overdrive gearing, a planetary gearset can also be used as a differential, either splitting a single source of torque along two paths or combining two torque inputs into one. 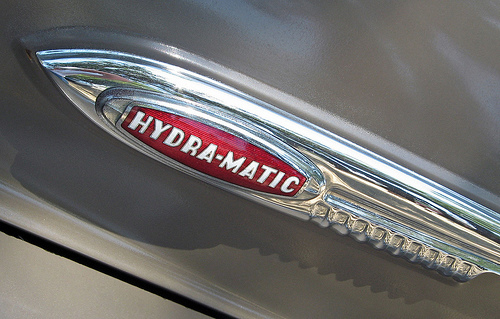 GM engineer Oliver K. (“O.K.”) Kelley applied the latter concept to the original Hydra-Matic as a way of reducing slippage in certain gears. To understand the Hydra-Matic’s split torque arrangement, it’s important to first review a couple of basic points about the transmission’s unusual mechanical layout. In the early Hydra-Matic, all power flowed through the intermediate shaft, which was driven by the planet carrier of the front planetary gearset and drove both the fluid coupling impeller (the driving torus) and the hub of the rear multi-disc clutch. This meant that the impeller always rotated at intermediate shaft speed, which was not necessarily the same as engine speed. The torus cover, which was bolted to the engine flywheel, drove the front oil pump and the annulus of the front planetary gearset at engine speed. However, if the front brake band was engaged, it locked the front unit sun gear so that the rotation of the annulus forced the planet carrier to orbit the now-stationary sun gear at reduced speed. This also multiplied engine torque; with the front brake engaged, intermediate shaft torque was equal to engine torque times the ratio of the front gearset. In first, second, and reverse, there was no torque split. The intermediate shaft still drove the rear clutch hub, but with the rear clutch disengaged, the hub just spun idly. Therefore, all intermediate shaft torque was applied to the impeller and then hydraulically transmitted to the turbine, the main shaft, and the sun gear(s) of the rear planetary gearset. In third and fourth, the rear clutch engaged, which locked the rear clutch hub to the rear brake drum, forcing them to turn with the intermediate shaft. Since the drum was affixed to the annulus of the rear planetary gearset, the annulus now also rotated at intermediate shaft speed. 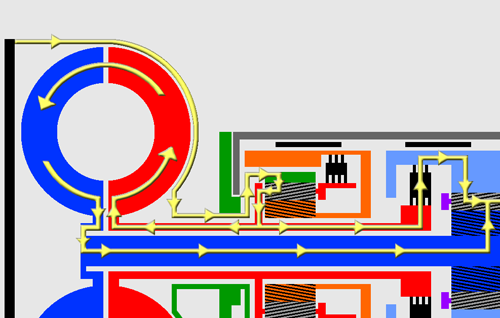 However, the intermediate shaft was also still driving the fluid coupling impeller, which continued to transmit torque to the turbine and the main shaft to the rear sun gear(s). Therefore, intermediate shaft torque was now split between the rear sun gear (through the coupling and the main shaft) and the rear annulus (through the rear clutch). The rear gearset’s planet carrier acted as a differential, combining those torque components and applying the result to the output shaft. O.K. Kelley likened this arrangement to a series parallel electrical circuit. Since the intermediate shaft was simultaneously driving both the rear sun gear and the rear annulus any time the rear clutch was engaged, intermediate shaft torque was divided between those gears. The proportion of that split depended on the gears’ respective numbers of teeth and thus their gear ratio. When torque was applied to the sun gear, the inertia of the output shaft (which was affixed to the planet carrier of the rear planetary gearset) exerted reaction torque on the annulus, attempting to turn it backward. However, with the rear clutch engaged, the annulus couldn’t turn backward because the intermediate shaft was driving it forward. The annulus therefore became a reaction member, multiplying the torque the sun gear applied to the planet carrier. At the same time, the torque on the annulus and the inertia of the output shaft exerted reaction torque on the sun gear. 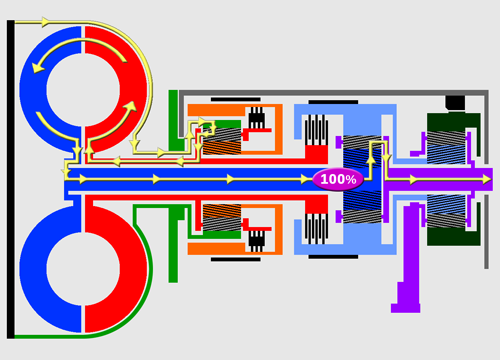 Again, the sun gear wasn’t free to turn backward since it was being driven forward by the main shaft. Therefore, the sun gear also acted as a reaction member, multiplying the torque the annulus applied to the carrier. In both cases, the torque applied to each gear had to be sufficient to overcome the reaction torque on that gear. Otherwise, the gear would resist and potentially stall the engine. This may become a little easier to grasp if we apply some actual numbers. Let’s consider, for example, the earliest Model 180 Hydra-Matic, the version offered in 1940–1942 Oldsmobiles. That transmission’s rear planetary gearset had a single sun gear with 45 teeth and an annulus with 69 teeth. With the sun gear driving, the rear clutch disengaged, and the rear brake engaged, the rear gearset had a ratio of 2.53:1 (1 + 69/45). With those gears, the rotation of the sun gear and the resistance of the planet carrier applied reaction torque to the annulus at a ratio of -1.53:1 (0 – 69/45) — that is, they attempted to turn the annulus backward at about 65% (100% / 1.53) of sun gear speed. To overcome that reaction torque, therefore, the annulus had to receive 1.53 times as much torque as the sun gear did. As we mentioned above, each gear acted as a reaction member, multiplying the torque the other gear applied to the planet carrier. However, each gear was receiving only a portion of the input torque, so only that portion was multiplied. In this case, torque applied to the sun gear was multiplied by 2.53:1 (1 + annulus teeth / sun gear teeth, or 1 + 69/45). With the annulus driving, the gear ratio was 1.65:1 (1 + sun gear teeth / annulus teeth, or 1 + 45/69), so torque on the annulus was multiplied by that amount. Again, in older Hydra-Matic transmissions, intermediate shaft torque was not necessarily the same as engine torque. In third gear, the front brake band was engaged, so intermediate shaft torque was equal to engine torque times the ratio of the front gearset. In an early Hydra-Matic, the front annulus had 54 teeth and the front sun gear had 24 teeth, so with the annulus driving, the gear ratio was 1.44:1 (1 + 24/54). In third, therefore, intermediate shaft torque (which again we can call TI) was engine torque * 1.444. Torque on the rear annulus (TA) was 60.52% of that, or about 87.4% of engine torque (1.444 * 60.52%). Torque on the rear sun gear (TS) was 39.47% of intermediate shaft torque, or approximately 57% of engine torque (1.444 * 39.47%). The overall ratio in third, therefore, was 1.44:1 (216.7 / 150). … and the overall ratio in fourth was 1.00:1 (150/150). In the early Hydra-Matic, the main shaft was hydraulically driven: It was splined to the fluid coupling turbine. 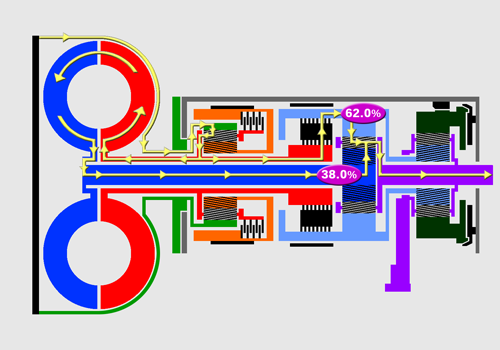 Therefore, the speed of the main shaft and rear sun gear were always reduced by slip within the coupling, causing them to turn slower than the impeller. The intermediate shaft was mechanically driven, so while there were frictional losses, there was no slippage as long the rear clutch was functioning properly. This meant that with the rear clutch engaged, the rear annulus was always rotating faster than the rear sun gear. In mathematical terms, the velocity of the annulus (let’s call it VA) had to be greater than the velocity of the sun gear (VS). The rear planet carrier “resolved” this speed difference — that is, rotation of the faster-moving annulus forced the carrier to orbit the slower-moving sun gear at some intermediate speed. For example, let’s suppose that a 1940 Oldsmobile equipped with Hydra-Matic is cruising in fourth gear at an engine speed of 2,500 rpm. Let’s assume for the sake of illustration that the fluid coupling is 96% efficient at coupling stage. Discounting mechanical losses, we can therefore assume that the turbine and main shaft rotate at 96% of impeller speed, or 2,400 rpm. The intermediate shaft rotates at impeller speed, which, since the front gearset is in direct drive in fourth gear, is 2,500 rpm. In other words, the annulus rotating at 2,500 rpm will force the carrier to orbit the sun gear at a speed of approximately 2,460.5 rpm. This reduces effective hydraulic slip from 100 rpm (4%) at the turbine to about 39.5 rpm (about 1.6%) at the output shaft. To be clear, this arrangement can’t and doesn’t prevent the coupling from slipping. Think of it rather as a slippage rebate: Hydraulic slip still occurs, but you regain some of the lost rpm in the planetary gears. 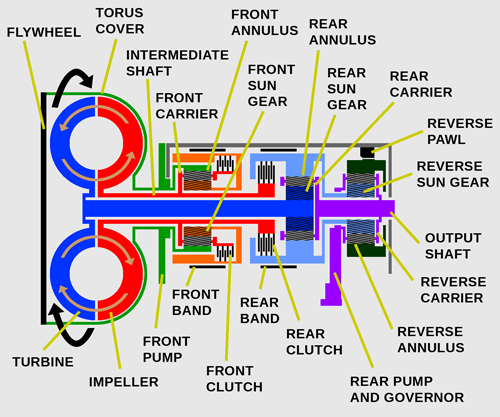 In this case, the split torque layout reduces the slippage-related speed difference between the engine and the output shaft by about 60.5% — which, not coincidentally, is the percentage of intermediate shaft torque that flows through the mechanical connection to the rear planetary gearset. Kelley’s patent disclosures described this effect as demultiplication of slippage. This demultiplication effect was not limited to cruising speed. As long as this transmission remained in third or fourth, the partial lockup reduced slip by 60.5% even under acceleration, when the fluid coupling was significantly less efficient. This would reduce total slip (excluding mechanical losses) from 400 rpm (13.3%) at the turbine to about 157.9 rpm (5.3%) at the output shaft. The split torque arrangement also improved engine braking — particularly in third gear, when the braking effect was further multiplied by the front gearset. One drawback of this arrangement was that the rear planetary gearset was always planetating (that is, the planet gears were turning relative to their carrier) even in top-gear cruising, which incurred more mechanical (frictional) losses — and potentially more noise and vibration — than a conventional direct drive arrangement where the planetary gears all turn at exactly the same speed. The reduced hydraulic losses more than compensated, but a true direct drive top gear with a fully mechanical lockup clutch would have been even more efficient. Still, you can see why GM’s corporate engineering team decided that wasn’t necessary. The split torque arrangement provided many of the benefits of a lockup clutch without sacrificing desirable fluid coupling advantages such as freedom from lugging and the ability to soak up powertrain vibration. GM’s Detroit Transmission Division, which built Hydra-Matic, used this layout for all single-coupling four-speed Hydra-Matic transmissions. The actual proportion of the torque split varied with the gearing of each application — for instance, Dual-Range Hydra-Matics, whose rear gearset had a single sun gear with 41 teeth and an annulus with 67 teeth, had a torque split of 62%/38% in third and fourth — but the effects and benefits remained substantially the same.